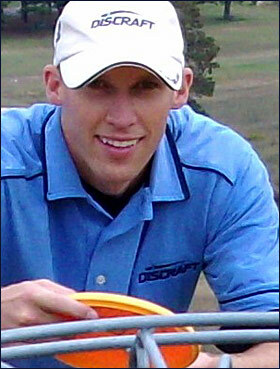 HOT SHOTS: 77 PDGA career wins. Top Worlds finish: 9th, 2005. Putting World Championship Titles: 2. 11 PDGA wins in 2013 including: Prairie Open, VMO, Brandy Lake Shootout, The Pickle Open, Skyline Classic, Velocity Discs Open. One of my most memorable events was winning the 2009 Mad City Open. Not only was the normal pressure of winning my first Super Tour on the line but my wife's due date was the day before the event started. With this being a tournament I have played in every year since I began as well as playing on my local courses, I took the chance and signed up for the event knowing that at any moment I may drop out and run to the hospital. After the first day I had a 2 stroke lead going into the final round and still no baby - that night I didn't sleep a wink knowing that I could have a chance at winning my first A-Tier or also becoming a father. The next day I didn't succumb to the tournament pressure (or lack of sleep) and proceeded to shoot the hot round of the tournament not only to win my first Super Tour Title but to also donate my winnings to the start of Ava's college fund for prolonging her birthday an extra day for her Dad. The first rule I have for not only beginners but everyone is to have fun out there! Whether it's your 2nd time out or your 50th Pro tournament, I believe the biggest key is to stay in the right mind set and to have fun. If you start losing your temper on a missed putt, not only are you bringing yourself down but also the others around you. Keep in mind it is just a game and the world will still be here the next day, even if that putt didn't go in. A good book that teaches you how to put yourself in the right mental state and stay there is 'Mental Toughness Training for Sports: Achieving Athletic Excellence'. I would recommend this book to anyone who is trying to improve on their disc golf game. Eighty percent of disc golf is mental! Learning to replace the negative thoughts of missing a putt or hitting a tree out of your head while throwing with positive thoughts or making the putt or hitting the fairway will drastically increase your chances of actually doing it. When you have confidence you always play better! A great way of building your confidence is practice and repetition. Next time when practicing putting, start out closer to the basket and don't move back until you are hitting the majority of your putts. The more you make, the more confident you'll be on the course. (174 gm) NUKE is the fastest and farthest flying disc to date! The first run ESP Nukes are a little more stable and very predictable with incredible distance. I use this disc for most holes over 450 feet. (174 gm) This is my go-to distance driver when trees are in play. The Z Plastic can absorb the tree hits at higher speeds better than the ESP plastic. (172-174 gm) I absolutely love the Z Force! It's my go to driver on most holes. It's stable, predictable, and fast! I use this disc for 300 to 450+ foot hyzer shots and also 300+ foot forehands. Since the disc is so predictable, it is also my go to drive for windy days. All around this is my favorite driver on the course. (174 gm) The Z Avenger is another great driver. This is my go to disc for any tunnel, turnover or slow hyzer shot. When trees line the fairway I go straight for the Avenger and let it rip. (174 gm) This is my go-to driver for forehands. It's a fast, very stable disc that great on a hyzer line. (174 gm) The Avenger SS is a great roller disc right out of the box. I use this disc for any type of roller or massive turnover shot and typically keep only new SS's in my bag. (178 gm) This is quite possibly the best disc Discraft has ever made. This midrange disc flies on whatever line it is thrown on. Very accurate, very consistent and feels great in my hands. This is my favorite disc from Discraft and also my go-to disc for any hole 300 feet or under. (177 gm) This disc is a must have on windy days! Due to the 2.5 stability rating, it's very stable and very predictable which makes it my go-to approach disc when the wind hits 20+ mph. (178 gm) The Wasp is my stable approach disc one step up from the Buzzz. I use this disc when there is a stiff headwind or sidewind and can still maintain my confidence that it will fly how I expect it too. (175 gm) I use the Challenger as my go to disc for putting. The stability of the disc make is great for those long jump putt shots with increased accuracy. (175 gm) I use this disc for short controlled turnover shots through the woods, also for any putts that need to finish to the right. Burlington, KY One of my favorite courses in the country! New Bethel, MN A very well manicured course with tough shots. Leicester, MA Very scenic and very challenging. Cable, WI A challenging 27 hole course with the most elevation change in WI. Charlotte, NC Another very challenging par 72 course.